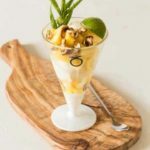 A fresh and simple cashew, lime and pineapple sundae. Combine the pineapple chunks and lime juice together. Put half the pineapple chunks in the bottom of the sundae glass. Add in the ice cream. Then top with the remaining pineapple chunks and cashew nuts.